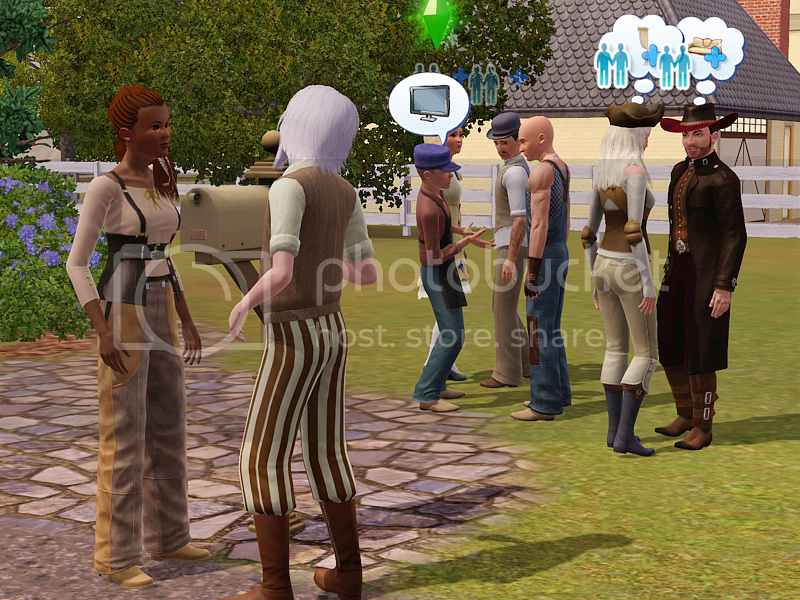 I am preparing to shoot a video of a summary of chapters 8 and 9 using The Sims 3. So I need a script. Anyone interested in helping out? Let me expand on this. I would like to co-write the script on the forum, see what we like to see in the video and if we can accomplish that. Idealy it would not run longer that 2 minutes. I think we can cut enough of the story to achieve that. All the story will be set in the old west, so we'd need 2 main locations for Harling Pass and Kanesville. Each location will have a couple of different sets, for instance the ship and the bar in Harling Pass and the dormitory, militia headquarters and the vaudeville theatre. What we need is to establish what parts of the story are really important for the rest of the story and for new (or old) members, as a means to 'read up' on what happened so far. - Steamhawke crew lands in Harling Pass, meets John Colton and gets in bar brawl. It's important to filter out what new members or readers absolutely need to know to be able to follow chapter 9 and beyond. Obviously chapter 9 isnt done yet, so if a crucial turn of events takes place, we'll add that. Created 8 sims to start with. Did not want to overload for people who browse the forum on their phone. - Colton is standing at the bar, the crew walks in, Colton gooses Daenelia, Daenelia hugs him. Two bounty hunters stand up and approach Colton, fight ensues with all crew and all visitors. - The Perrys are walking through town, a tainted runs past, a group of about 5-6 people chase him. The Perrys hug, Bridget cries, Remy looks grim. - Katherine offers map to Daenelia, Mysterious Valentine watches from the shadows. Anyway, as soon as I have time I will start shooting this, with abbreviated stories, as we dont want to make it too long. I will always focus more on characters still in play at the moment.